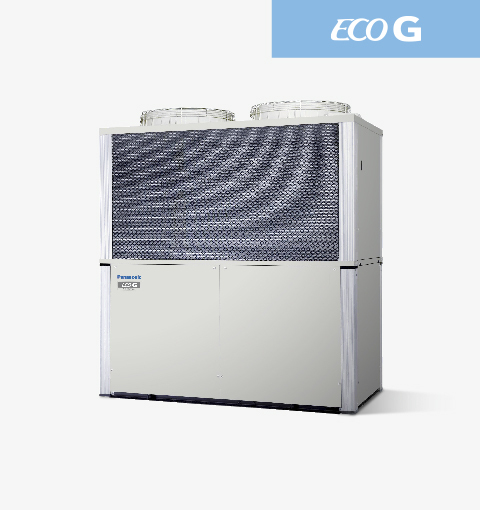 ECOg - gaz VRF systems | KONDICIONIERI PANASONIC | KONDICIONIERIS PANASONIC | "SIA RIKON AC"
The new Gas Heat Pump from Panasonic is the ideal solution for projects with electricity supply problems. As you would expect, all our gas-driven VRF systems have the highest reliability rates in the industry and a leading customer service programme. The torque and rpm control functions of the GHP’s motor are comparable with an inverter-type electric air conditioner. Thus, the GHP ensures individual, and efficient control and performance - just as you expect from an electric inverter controlled air conditioner. 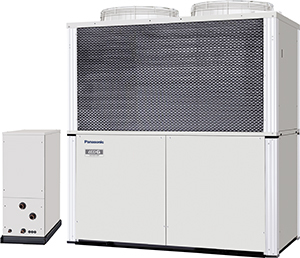 The advanced Gas Driven VRF systems offers increased efficiency and performance across the range. Now more powerful than ever before, it can connect up to 48 indoor units. Improvements include increased part load performance, reduced gas consumption with a Miller-cycle engine and reduced electrical consumption by using DC fan motors. Load can easily be increased in the future by the addition of indoor and outdoor units without having to plumb pipe shafts. When specifying refrigerant pipe work, please choose the size according to the horsepower after the increase of units. 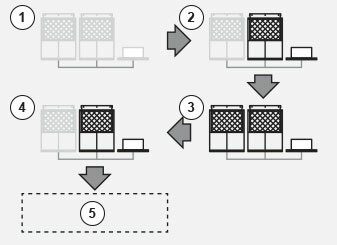 Maximum possible number of outdoor units to be combined: 2 units. Maximum horsepower of combined outdoor units: 50 HP. 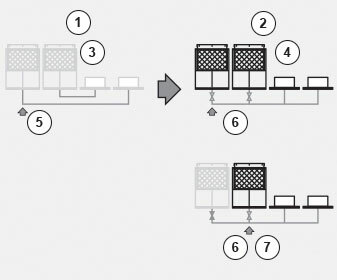 Maximum possible number of indoor units to be connected: 48 units(1). 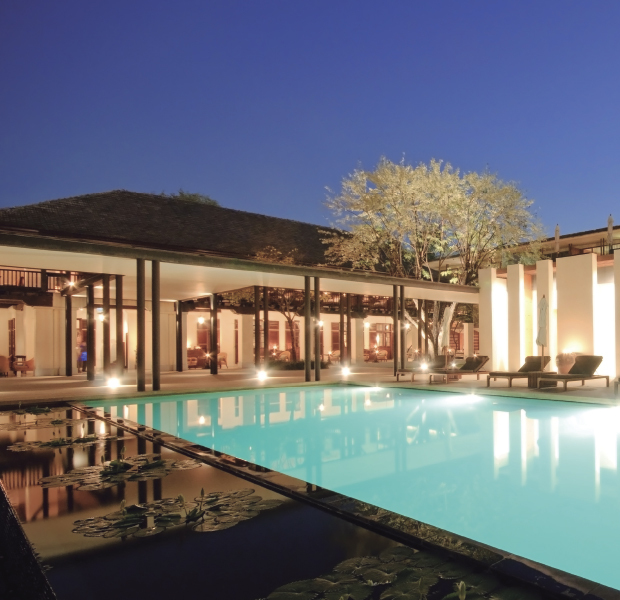 Indoor/outdoor units capacity ratio: 50%-130%(2). 1. When 2 outdoor units are connected. 2. Capacity of indoor units connection is: Minimum 50% of the capacity of the smallest outdoor unit within the system. 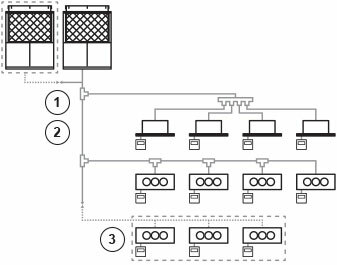 Maximum 130%: total capacity of the system outdoor units. Indoor units are same as multi series for buildings. 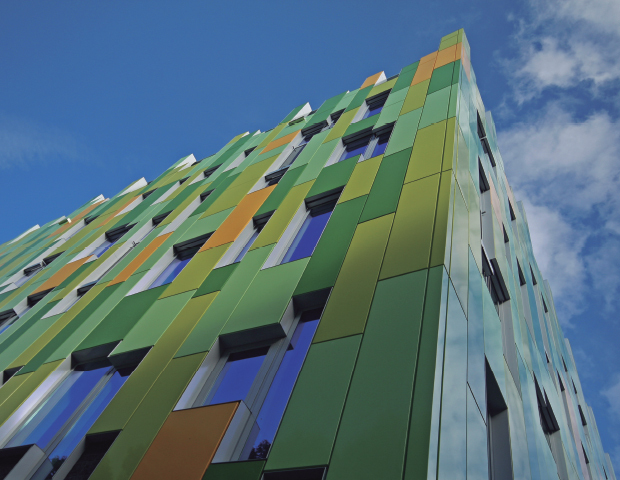 Energy savings achieved by the Appropriate Capacity. 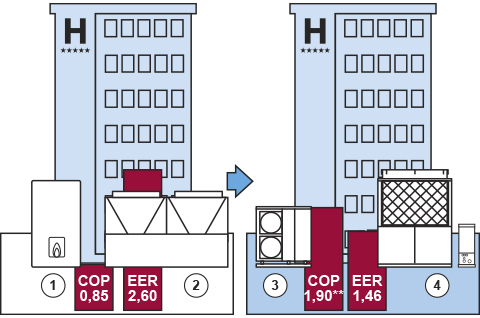 Energy savings are achieved by the Appropriate Load Divider Function, which enables efficient operation by concentrating the cooling/heating capacity to one outdoor unit and stopping the other. Compared to conventional machines with a similar COP, this function allows energy savings and thus reduces the running costs, especially in part-load seasons like spring and autumn. System will not stop even during maintenance, due to Manual Backup Operating Function. Maintenance is possible during weekdays because it can continue operating during maintenance. Automatic Backup Operating Function enablescontinuous operation. 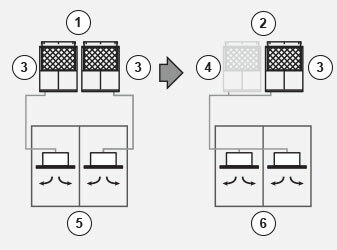 If one outdoor unit stops the backup function will automatically start on the remaining unit and continue operating. 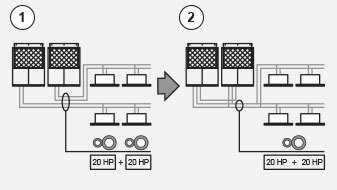 During service intervals, the system being serviced can be isolated by a closing valve in the outdoor unit, enabling continuous operation with the still operative outdoor unit. Renewal period prolonged due to rotation function. Rotation function, which is run from outdoor units with low operating time, will average the operating hours of each outdoor unit. This extends the periods between maintenance or replacement. By using common header pipe work the installation cost and time is significantly reduced. 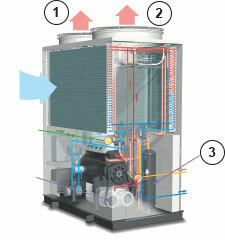 GHP + WHE heating, cooling and DHW. Excellent applicability when there is a thermal demand for heat, DHW and cooling, as well as additional thermal usages such as swimming pools, SPA, laundries: Hotels, sports centers, hospitals, gymnasiums, homes, shopping centers, etc. 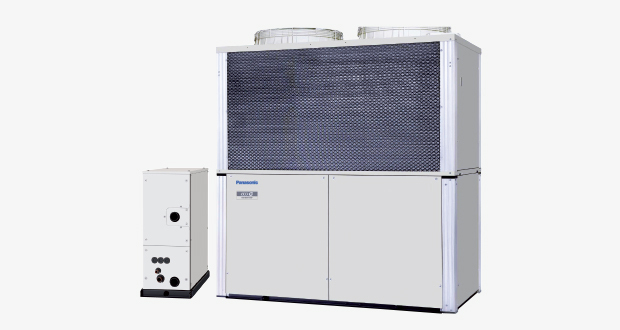 Combined with a Water Heat Exchanger unit, the Panasonic GHP can create a flexible system, the ideal replacement for existing chiller and boiler systems in order to increase efficiency and reduce CO2 emissions. Oversizing is reduced by keeping the power at a low temperature. Electrical demand spikes or possible costs derived from investments in new electrical infrastructures are lowered. Example of Hotel renewal of existing Chiller and Boiler system with Panasonic GHP and Aquarea mixed solution. GHP and Aquarea are the smart solution for renewal Chiller/Boiler applications with annual running cost savings around 13.600€. * Electric to support pick of consumption on domestic hot water. ** COP including HSW (U-20GE2E8). EER and COP calculated in primary energy. In heating mode, at very low outdoor temperature -21°C, the available power is maintained. 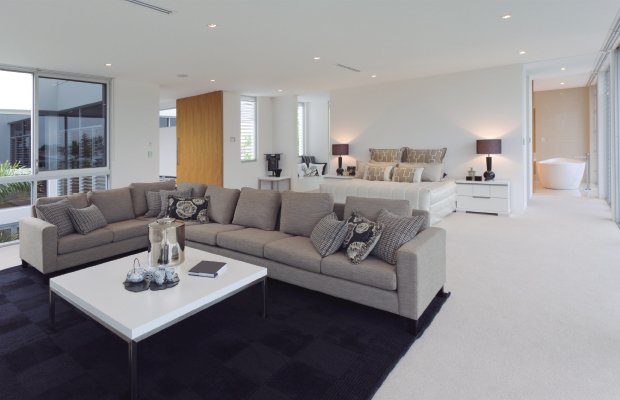 No defrost cycle happens and stable heating comfort is guaranteed. 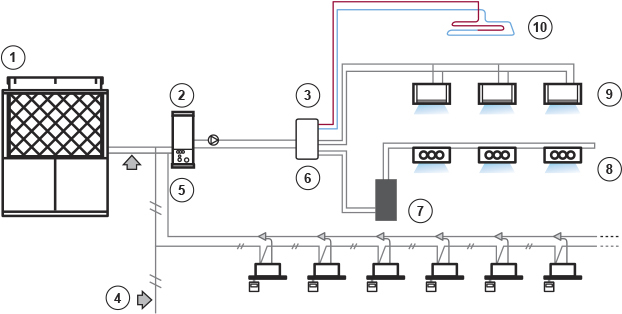 Note: The mode of running of outdoor unit depends on the Water Heat Exchanger’s mode. The water pump is not included in the Water Heat Exchanger unit. For simultaneous operation, however, the maximum capacity is 130%. Please inquire details of this system design of Panasonic. * Standard DX type indoor unit system. Panasonic Gas Heat Pump is the natural choice for commercial projects, especially for those projects where power restrictions apply. As you would expect, all of our Gas Driven VRF systems are designed to give the highest reliability rates. The GHP engine or (internal combustion engine) varies the engine speed to match the building load functions that are comparable with an inverter type electric air conditioner. Electricity supply freed up for other uses such as IT servers, commercial refrigeration, manufacturing, lighting etc.